The original town of Wood River, named for the tree-lined river directly north, was platted around a station established here by the Union Pacific Railroad in 1866. Jackson moved his store to the settlement, and a log Catholic Church and settlers’ school were built by 1869. In 1874-75 the Union Pacific platted the present town of Wood River about three miles east. The station, post office, and Jackson’s store were placed on skids and moved to the new location. In 1990 only St. Mary’s Cemetery and the District 5 school marked the original townsite. Hall County Historical Society. Nebraska State Historical Society. 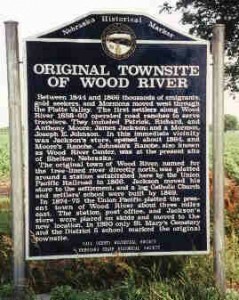 The marker is located 4 miles east of Wood River, Nebraska on highway 30.